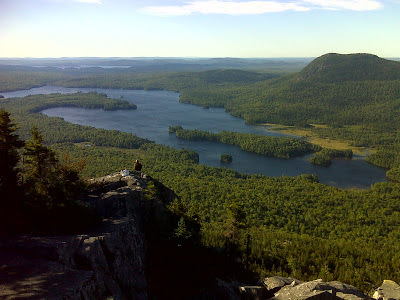 Lake Onawa, Borestone Mtn., and pristine Maine wilderness from Barren Slide viewpoint. Of the 10,000 +/- photos I took during this ten month adventure, this is my favorite. General Impression/Theme: Water. I was inundated by a two hour Monsoon with thunder, lightning, small hail and at least five inches of rain while hiking past half a dozen gorgeous ponds. I had more stream fords in this section than any other by far, and rode the official AT ferry across the Kennebec River. 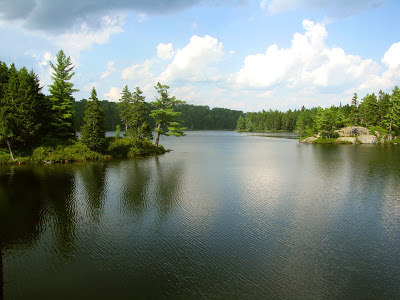 And when I was well above the water it was still visible: Maine's glorious lake country was always on display. People: 'Hillbilly Dave', Kennebec River ferryman and trail icon. 'Birdman', flip-flopper headed from Katahdin to Port Clinton, PA, having finished everything south of there already. We had many mutual acquaintances. Thru hikers 'Rainbow' (52) and her hiking partner, the intrepid 'Mammaw B' (71). They left Springer on March 15 and March 5 respectively, hooked up early, and had remained together ever since. Rainbow had seriously pulled a groin muscle near Sugarloaf Mtn. and was hobbling along at no more than a mile per hour. Yet Mammaw B was sticking with her to the end. I'm afraid Rainbow might have been unable to do the demanding climb up Katahdin to finish her hike. The log book at Katahdin Stream Campground Ranger Station was ominously silent on this subject, and so I've worried about her ever since. 'Santa's Helper' who I met twice, once doing trail magic on a day off, and once on the trail, headed NoBo to Katahdin. A couple of other hikers mistook me for him, as we both had significant white beards. Last but not least was Audrey, the ridge runner for this section. Supply/Overnight: Jimmy's (an independent locally owned grocery store) in their expansive new location on the south side of Bingham, ME. Robbins Hill overlook rest area near Twelve Corners. Trailhead parking lots. Angry torrent that I had to push through, was a dry footpath an hour earlier. Worst Memory: The afore-mentioned Monson Monsoon: Although this anomalous stationary storm happened in a tropical airmass with temperatures never getting below 60F, the relentless two-hour downpour, complete with plenty of hail, brought me closer to hypothermia than at any other time on the trail. 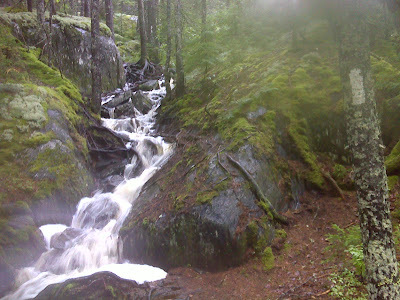 I was slogging through calf-deep fast flowing water where dry trail had once been, then negotiating exposed bedrock as lightning crackled overhead. This intense experience is seared in my memory forever. Best Day Hike: From Troutdale Road (Moxie Pond Road?) near Joe's Hole on the south end of Moxie Pond, head north on the AT over Bald Mountain, also called Moxie Bald. This mountain is made of the most extraordinary solid granite slabs I've ever seen, unrivaled anywhere else on the trail. Here are billion year old walkways that are smooth and level. The views are to die for. 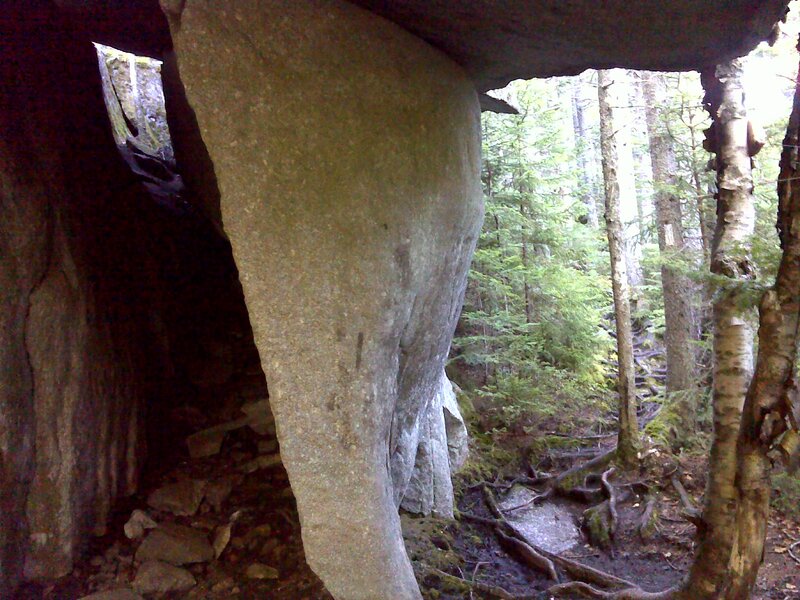 On the way up (NoBo) you'll pass under a massive rock slab (I call it the Lobster Claw) where there's an opportunity for a trail reroute through a narrow tunnel that would make the Lemon Squeezer and Fatman Squeeze seem 'half-assed' by comparison. The hike up to Barren Ledges is another great choice (photo up top) - it's a little known fact that this walk is a fairly easy day hike accessible by car from Monson via Elliottsville Road, exactly 11.8 miles east of ME 6/15, through the Bodfish Intervale (cross the bridge after the 'private road' sign), then left past Otter Pond to the end of the road at a side trail trailhead with an 0.8 mile walk to the AT then just another couple of miles to those killer viewpoints. If possible make this a one-way hike, continuing on north and coming out at Gulf Hagas, with great views from several more summits. Finally, I also strongly encourage day hikers to take the AT northbound from the big Monson (ME 6/15) parking lot at least as far as the stunningly picturesque North Pond. You'll pass three other pretty ponds along the way.